Description: On consignment we have a Colt Single Action Army 3rd Gen revolver in .44 Special. 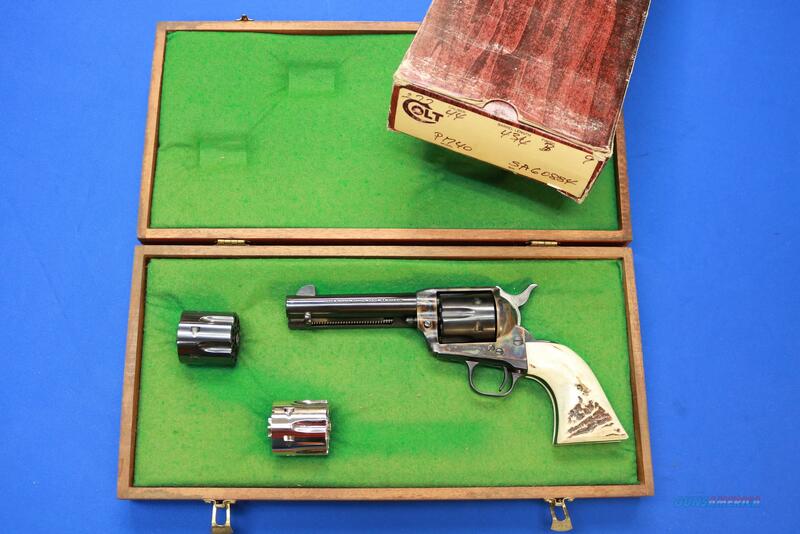 This revolver is unfired in factory box, and features a gorgeous case colored frame with blued 6-shot fluted cylinder, and 4.75" barrel with fixed sights. Gun comes in factory box with original grips as well as stag grips. Also included are a nickel .44 Special cylinder, and a blued .44-40 cylinder. The nickel cylinder is a tight fit, and doesn't turn as freely as it should. The .44-40 cylinder is an excellent fit and functions perfectly. Gun also includes factory paperwork and a wooden display case. Gun has had a single owner, and has never been fired.